1. Something that a situation demands, or makes, urgently necessary and which puts pressure on the people involved: "They had to cope with the exigencies of the financial situation." 2. A difficult situation requiring urgent action. 3. Urgent requirements; pressing needs. 4. The needs, demands, or requirements intrinsic to circumstances, conditions, etc. 1. Needing immediate action or aid. 2. Making heavy demands on someone. 3. Requiring much effort or expense; demanding, urgent, pressing. 1. Referring to the need for immediate action or remedy: "The financial market called for exigently fast solutions." 2. Characterized by much effort or expense; demanding. Exigent and pressing suggest an urgency that requires prompt action. 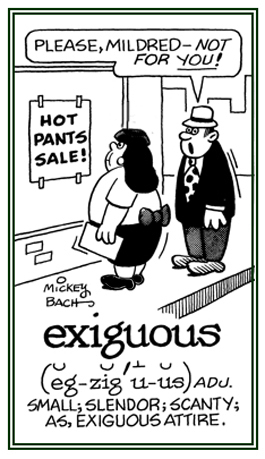 Pertaining to something that is scanty or meager: Mildred was wearing exiguous clothing which was not sufficient for the cold weather she was being exposed to. © ALL rights are reserved. A chemical compound or substance used while it is a gaseous state: "Ted had a man come to his farm to spray a fumigant of pesticides and disinfectants to make the barn safer for his live stock." 2. To use chemical compounds in a gaseous state to clear an area of insect pests or other unwanted organisms. 3. To scent with fumes; to perfume. 1. The act of fumigating or the application of a gas or smoke to something for the purpose of disinfecting it; the use of a fumigant. 2. Etymology: "to make aromatic smoke as part of a ceremony" from Old French fumigation, from Latin fumigationem, fumigatio, from fumigare, "to smoke"; from fumus, "smoke, fume" + root of agere, "to drive". The sense of "to expose (someone or something) to aromatic fumes" is originally a reference to a medicinal or therapeutic treatment. Someone who or an apparatus that applies smoke, gas, or perfume for a special situation. An air-tight container or a building in which a gaseous substance is applied; especially, for plants. A room or an apparatus used for spreading smoke or a vapor for disinfecting something. Overly active; such as, the inability to relax or to sit quietly: "Hyperactive children are characterized by constant motion-exploring, experimenting, etc. ; and this condition is usually accompanied by distractions and frustrations." "Some medical specialists suggest that a hyperactive adult might have brain damage and psychosis, but not necessarily." 1. A condition characterized by excessive restlessness and movement. 2. A higher than normal level of activity. A body organ can be described as hyperactive if it is more active than normal and a person's behavior can also be considered as hyperactive. Showing page 9 out of 15 pages of 217 main-word entries or main-word-entry groups.